Question: How do we start the new year (and most would argue new millennium) with a bang? 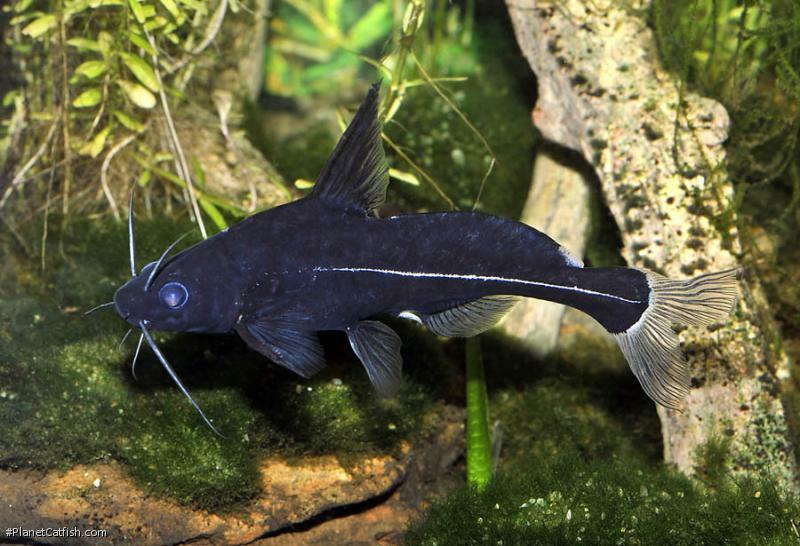 Answer: The black lancer as this month's featured catfish. This is one of my all time favourite fish, and what a fish! Let's hope what I have to say about it lives up to the fish itself. The black lancer is an occasional - verging on rare - import. You may wait years without seeing one then have the chance at some only for them to disappear without trace for another year or three. Given the state of individuals offered for sale it is perhaps understandable why they are uncommon imports. Always young (maybe 2" or less) fish are offered for sale, often in terrible condition. Typically pencil thin, it is a testament to the fishes hardiness that they make it at all. A young black lancer isn't a particularly striking fish. The caudal and dorsal fins are undeveloped and the fish is a dull black. Slightly larger, healthier youngsters show the beginning of the fishes characteristic white stripe. Its nature doesn't help either; the fish are light-shy and timid, especially in unfamiliar surroundings. Baensch (p305) shows a good representative picture of a sub-adult. This was the way with my first lancer; when I saw it for sale it wasn't looking too bright and although the asking price wasn't exorbitant, I hesitated about purchase. Thankfully my desire to learn more about a fish I had never seen alive before won the day. The straggly individual was quarantined for a fortnight where it ate, hid and did little else. After quarantine it was released into a 3 foot long community tank. It grew quite slowly but soon had developed a distinct white chalk-like line along its lateral line. Around the 5" mark (when I transferred the elusive fish into a much larger tank) I noticed that the dorsal fin was considerably more elongate than formerly, and the caudal fin looked, well, normal. Seven years later the fish is just over 8" long SL (around 20cm) and shows no sign of getting any bigger. The picture above was taken last month (December 2000). The dorsal fin is nearly 3" high (around 6cm) and elegant, curling extensions roll from the tip of both caudal fin lobes. The lateral chalk-line is brighter than ever and the fish remains a uniform velvet black. Most older hobby literature places the Blank Lancer in the genus Bagroides mainly because older scientific literature placed the fish there. However, notice the fishes long rolling adipose fin. According to Kottelat et al, this feature (as opposed to a shorter fin that curves back on itself) places the fish in the genus Bagrichthys along with a few other species previously in Bagroides. The other three species of Bagrichthys do not match the fish pictured here. B. hypselopterus from Sumatra and Borneo grows too large (TL 400mm = 16") and even at a smaller size (TL 234mm = 9") has a much steeper predorsal profile. The "lance" dorsal fin is long enough to reach the base of the caudal fin and exhibits a flowing extension. If the fish pictured here grew larger (and taking into account the change of the fishes shape from juvenile to that pictured here) I would fully accept that this is our fish, but it appears to have stopped developing at its current size. B. macropterus and B. micranodus share a tan and cream colouration and lack such a striking dorsal fin, although the latter displays the characteristic chalk-line. There is the outside chance that this is an undescribed species; a smaller version of B. hypselopterus perhaps. The only two adults I've encountered appeared to be both females: perhaps the larger fish is an adult male. To me these speculations seem unlikely, but until we get imports of the other lancers (now that IS something to look forward to) and aquarists raise them to adulthood, I'll stick with this identification. Dr. Rudiger Riehl & Hans A. Baensh. Aquarium Atlas Vol. 3. (Baensch - Tetra Press 1996). Maurice Kottelat and Anthony J. Whitten, with Sri Nurani Kartikasari and Soetikno Wirjoatmodjo. Freshwater Fishes of Western Indonesia and Sulawesi. (Periplus Editions (HK) Ltd. 1993). David Sands. Catfishes of the World Vol. 5 Bagridae and others. (Dunure Publications 1985). Gina Sandford and Richard Crow. Interpet Manual of Tankbusters (Salamander Books 1991). Type Locality East Sumatra, at the confluence of Lamatang and Enim rivers, Indonesia. Etymology Bagrichthys: From bagrus, the name of a catfish genus frequently used to form generic names, and the Greek ichthys, meaning fish. Identification Members of the highly specialized and unusually-shaped bagrid catfish genus Bagrichthys Bleeker, 1858, live in large muddy rivers throughout Southeast Asia and are characterised by their elongate and laterally compressed caudal peduncle, the dorsally-directed serrations on the posterior edge of the dorsal-fin spine, gill membranes united but free from the isthmus, and a long adipose fin without a free posterior margin (Roberts, 1989). The other three species of Bagrichthys do not match the fish pictured here. B. hypselopterus from Sumatra and Borneo grows too large (TL 400mm = 16'') and even at a smaller size (TL 234mm = 9'') has a much steeper predorsal profile. The ''lance'' dorsal fin is long enough to reach the base of the caudal fin and exhibits a flowing extension. If the fish pictured here grew larger (and taking into account the change of the fishes shape from juvenile to that pictured here) I would fully accept that this is our fish, but it appears to have stopped developing at its current size. B. macropterus and B. micranodus share a tan and cream colouration and lack such a striking dorsal fin, although the latter displays the characteristic chalk-line. Sexing Males genital papillae is visible. Pictures in various hobbyist books appear to show this even on quite young fish. Females do not have this feature. Other Parameters No more than a gentle current. Feeding Readily accepts prepared foods. Frozen brineshrimp appears to produce the most activity from the fish and frozen bloodworm is also relished. Furniture The fish loves tangles of plants which it carefully inspects for morsels of food after lights out. A suitably sized pipe or cave is required for this fish as it can quite easily damage itself in panic if this is not provided and easily entered and left by the fish. Heater elements should be guarded or positioned so that they are not used for refuge - this fish is prone to heater burns. Compatibility A timid fish that does well in a sizeable aquarium inhabited by smaller fish. Although a night-time prowler, even small fish are safe enough. Suggested Tankmates Shoals of barbs and rasboras are ideal and their ceaseless activity counters this fishes extreme shyness. The presence of larger shoals of fish appears to give the black lancer more confidence than it would have in, for example, a catfish only aquarium. In addition, the other fishes increased activity at feeding time often prompts the lancer to leave its lair in the quest for food. Adult lancers require a lot of room if to be kept together. I have a pair that lightly quarrel (nipped fins, the odd scratch) in a 48''x30''x30'' aquarium!